These agreed term dates provide a guide. Sometimes a school may adjust the dates slightly due to specific circumstances, and we recommend that you check with the school if a specific date is key to your plans, e.g. before making a holiday booking. 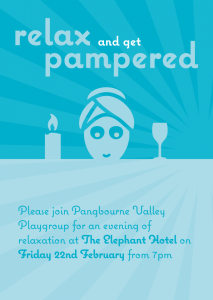 Pangbourne Valley Playgroup will hold their annual Pamper Evening. Friday 22 February from 7pm. As well as being a lovely evening it raises much needed funds for our village Playgroup. Tickets are £5 and include a drink on arrival. Treatments are from £10.